It’s old news that influencer marketing can drive brand awareness and spike sales. But what makes this post stick out above any another marketing post about influencer marketing is that I’m about to dive in and explain how your brand can use influencer marketing tactics through the whole sales cycle and to improve customer experience. After all, when looking at a brand’s overall worth, both sales and customer experience (CX) are considered. While many companies are throwing time, resources, and money at improving the buyer and consumer journey, your brand should consider inviting a different kind of guest: influencer marketing. First off, check out this massively important study put out by Traackr and Top Rank Marketing, as there’s a ton of data and progressive ideas in there. The main idea is one we’ve talked about a lot: Marketing and CX are fluid and ongoing journeys, rather than finite and linear processes with a beginning and an end. One phase flows into the next, always with an eye on the past and the future of the cycle. A campaign is never completely over, and the ways we measure CX and ROI need to incorporate more than revenue and clicks. 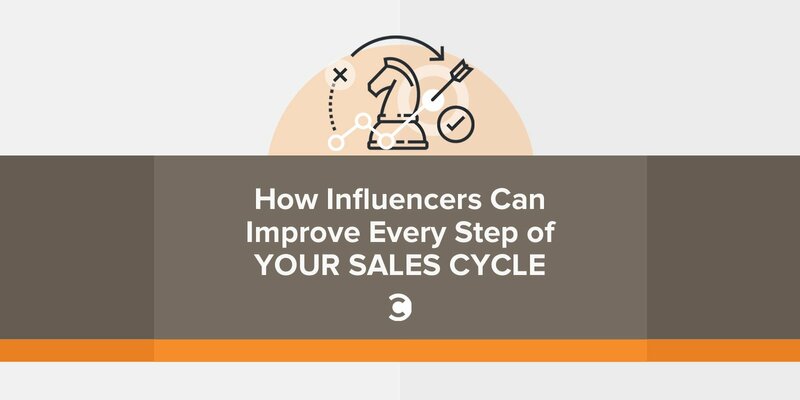 Let’s work through the sales/CX cycle in both B2B and B2C situations, and see where and how influencers can connect with your customers. This is the step where influencer marketing has proven to be very valuable, as it’s part of brand awareness. Businesses and customers are searching, researching, reading, and watching every video and blog and retail site review they can find. They might find their way to your website eventually, but first, consumers want trusted peers and experts to voice their opinions, concerns, and recommendations. Having your brand and products strategically in place with the help of influencer partners spreading word of mouth recommendations during this search/research phase is crucial. By now, the customer has gotten curious enough to visit your site and social channels. Now that they’ve self-directed themselves to your channels, the potential consumer is far enough along in the journey that they actually want to hear from your brand now. Still, a brand doesn’t need to be too boastful. While your site and social channels should be filled with your brand’s words, those words should be informational messaging about your product. On these channels, there should also be a second perspective woven throughout—the consumer and third party opinion. Influencer messaging is great content to weave into a brand’s owned channels. Repurposing quotes, photos, post links, and more adds more depth and credibility to your brand’s channels while the voice of your brand explains sticks to the facts for interested potential consumers. Once a consumer looks at peer reviews, listens to what your brand has to say, and likes what they read and hear, it’s a logical next step that said consumer will be ready to buy. What’s going through their head at this point? What do they need? Well, a little reassurance goes a long way. Employing influencers to relay their experiences at this stage can help the customer avoid that dreaded buyer’s remorse and gives your brand the chance to showcase a little social proof. Once a consumer has purchased and their status is marked in the marketing automation platform of your choice, an onboarding process usually takes place. Whether it’s to train a consumer on a product, give them ideas of how to wear your brand’s new piece of fashion, or provide them with recipes that use their new cooking gadget, new consumers should be dripped and offered help and tips. Think of the popular unboxing videos or #lifehack posts where influencers share their direct experience with a given brand. Partnering with influencers who will showcase your product and offer their own tips on how to interact with it, in conjunction with your brand’s words of advice, can reassure the buyer of their purchase and ensure they’re getting the most out of it, so that they, in turn, become influencers or advocates for your brand. See the snowball effect happening here? Keep in mind that while you are certainly trying to make the CX better from this phase forward, you are also trying to better understand how that experience feels—or, at least, should feel. Having a comprehensive knowledge of the new or repeat customer’s impression is extremely valuable and something many companies struggle to achieve. Influencers with honest opinions can provide loads of pertinent data. They’ve already walked a day in the new customer’s shoes and can provide detailed and candid reports on how it felt. It’s their job to do so, as influencers are, by trade, excellent communicators and usually have the brand’s best interest at heart. All departments should pay close attention to this and constantly tweak and improve. At this point, the customer is well into product usage. Every marker knows it is a lot cheaper to retain a customer than get a new one. This fact motivates strong customer service teams at plenty of companies, but many don’t use influencer power during this phase. Maybe they should. An ongoing weekly video showing how much money your payroll software is saving, how effective your vacuum cleaner is after two months, or how many different meals you can create with your gluten-free pizza crust is authentic and evergreen content. Influencer-generated content can give customers new ideas about using your product, keep them engaged with your brand, and add a variety of resources for your customers. Think of it like this: Influencers are building content for your brand that can potentially make your brand “sticky” to the consumer and will increase the chances of the consumer renewing a service, upgrading an item, or buying more of your brand’s products. Not only can influencer-generated content reassure the customer, but it can also reach backwards in the cycle to prospective buyers who might wonder how the product holds up over time. This builds and nurtures your relationship with both your influencers and consumers while increasing brand loyalty. Keep your influencer relationships strong, and have them use your product for the long haul. Recommendations after a year of use have an authenticity and level of experience that is extremely valuable. 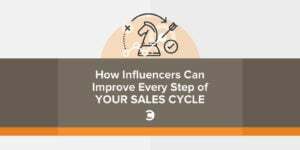 We’ve now come full circle into the first phase of sales and consumer journey with influencers along for the whole ride. Which areas of your brands customer journey can you strengthen with influencer partnerships?